This recipe means home to me. It is simple and tasty. It’s easy to please the family with it, and it’s a perfect “life jacket” in echoing-fridge situations, or if friends are unexpectedly staying over for supper. The recipe requires white wine for toasting the rice and vegetable stock for cooking it, but you can be free to skip the first – especially if you’d better offer it to those friends who are staying for supper – and to substitute the second with an easy stock cube or gel portion (then, just be careful with the salt for seasoning). If you want to use chicken stock or any stock mead with meat, you would do better to skim the excess of fat before using it, so it will not weight down the flavors. If you can’t have access to any white wine, then simply skip this part after toasting the rice. Note for the users: please click on the label “HOWTO” to watch the slide-show of each cooking step. *you can also use other type of rice like carnaroli or vialone nano. **in alternative, 1,3lt of boiling water and one stock cube or gel portion. Melt the cubes or gels in boiling water and sieve before use to clean it from undesired pieces of vegetables. Also reduce the amount of salt that follows. ***reduce to taste if you are using stock cubes or gel portions. *in alternative, 1,3lt of boiling water and one stock cube or gel portion. Melt the cubes or gels in boiling water and sieve before use to clean it from undesired pieces of vegetables. Also reduce the amount of salt that follows. **reduce to taste if you are using stock cubes or gel portions. Put the vegetable stock to boil on a high heat and add the salt. If you are using stock cubes or stock gel portions, then season the stock to your taste. Put the deep saucepan on low heat with the first amount of butter and let it melt gently and slowly. Meanwhile, mince the onions into a thin and uniform brunoise*. When the butter has melted but it has not started frying yet, add the onions and spread them evenly. Keep stirring and let them to absorb the fat. Increase slightly the heat and let them start frying gently until they become slightly translucent. Season with salt and black pepper, then keep stirring while they tenderise. Increase the heat again and pour in the white wine, which will start sizzling and bubbling. Allow the mixture to reduce till it becomes smooth and it gets a light golden colour setting the heat a bit lower if necessary (it must not brown more than it already has). Add the tomato passata. Stir on medium heat for 5 minutes, allowing the ingredients to gently blend in. Lower the heat under the saucepan. Grate the parmigiano cheese and set aside. With a paring knife, chop off the onion’s tip. Clean the roots, halve it and peel off the tunics. Put each half facing down on a chopping board. With either the paring knife or the tip of the chef knife, make vertical cuts - 2millimeters apart from each other - driving the tip of the knife as close to the roots as possible. Hold the onion together with one hand’s fingers, get the chef knife and with a fulcrum movement complete the mincing with narrow cuts. 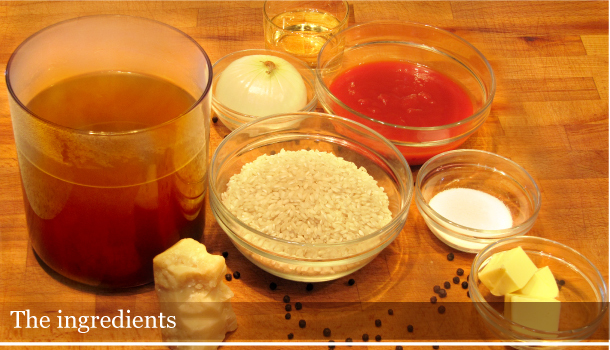 While the sauce gets to a gentle simmer, start toasting the rice. Toasting the rice is absolutely essential for a good and appropriate final result. If its grain would not be going through this process, instead of a risotto, you would be serving a mushy sticky soup. The exposure of each single rice grain to direct heat will seal its pores allowing the grains to be maintained whole during the cooking. This dry method is the perfectly appropriate for this kind of risotto, since the liquid main flavouring ingredient would not be able to seal the grains. But rice can also be toasted in a fat with a frying flavouring base. Spread the rice evenly in the nonstick frying pan and put it on medium-high heat. Keep stirring and tossing the rice so that all its grains will gradually gain a distinctive pearl-white colour in the centre and slightly translucent edges. When ready, the grains will start resisting the stirring lightly and they will make a tingling noise hitting the pan’s sides. Now, add the wine all at once and stir so it wets the rice evenly (step 3 - pic. A). Keep stirring while the wine reduces and all the alcohol evaporates, but do not dry completely (since the rice can not be burnet during this process, consider to reduce the heat under the pan). Immediately add the rice to the saucepan with the tomato sauce, set the heat on a low power and stir evenly (step 3 - pic. B). Make sure the stock is boiling intensely and let the rice soak in the sauce for a couple of minutes, so the aromas will sink into the rice grains and the wine will evaporate completely. With the heat set on low power, pour in almost three ladles of stock (step 4 - pic. A). Let it gain the boiling again stirring continuously, while the rice grains gradually absorb the liquids. Keep adding stock ladle by ladle making the rice absorb it each time (the stock must be kept boiling, otherwise it will drop the temperature of the mixture and block the cooking). Carefully increase the heat gradually. Depending on the type of rice you are using, the cooking will take from 15 to 18 minutes and you will end up with a creamy but steady mixture. Check if the rice is cooked: it must be “al dente”. Which means that the grains have to be cooked right to their core, but they still can put up resistance to your chewing. If it tastes still raw and it is too crunchy, carefully add some more stock (from the 200ml extra dose). Check the seasoning, correct the salt if necessary and stir (step 4 - pic. B). Get the saucepan off the heat. Let the rice rest for about three and a half minutes (ratio should be: three minute every kilo of risotto). This resting is essential to stabilize the starch. Then, add the butter to the risotto and stir allowing the fat emulsifying with the starchy liquor (step 5 - pic. A). Use the spoon or the spatula to bring the rice from the outside to the centre in large circular movements, collecting it from the bottom and moving it to the top. Add the cheese and stir again to mix it evenly (step 5 - pic. B). The mixture will gain consistency becoming creamy and billowy or “all’onda” as we call it in Italian (step 5 - pic. C). If you think it’s still too thick, gradually add small amounts of stock and stir again. That's why it is easier to bind the risotto when it is slightly drier rather than too runny: after adding the butter and the cheese you can't put it back on the hobs. Allow it to rest for no more than one minute and then serve it.